If you can’t stand the heat, get out of the kitchen, and get out fast. Grocery is undergoing its biggest shakeup since commercial refrigeration, and the only thing we know for sure is that it's getting even more nutty. Amazon recently announced its $13.7 billion dollar acquisition of Whole Foods, a golden union that has the entire industry reeling — from Walmart, to Kroger, to meal kit delivery services like Blue Apron. Traditional and non-traditional grocers across the country are already bracing themselves against the implications of the Whole Foods acquisition, with some stock prices plummeting double-digit percentage points, as much as 14.86%, in wake of the announcement. And while all grocers are shaking in their aisles, one group of competitors seems especially vulnerable. Services like Blue Apron, Hello Fresh, Sun Basket, Purple Carrot, Chef’d and Plated currently reach about 1% of adults according to research firm Mintel. Their bread-and-butter customers are individuals who value their time and healthy, fresh food. It would seem that meal kit makers have been gaining traction, Blue Apron alone has around 1 million customers and more than $790 million in annual revenue — although their initial public offering is (so far) broadly considered a failure. The squandered IPO is largely due to high customer acquisition costs, but there are many other factors making it difficult for meal kit makers to stay afloat. Some of these include the influx of new entrants, a fracturing competitive landscape, and, of course, Amazon. With the lines blurring between grocery and meal kit delivery, the question becomes, “How can meal kit makers stand out amidst the noise?” DemandJump wanted to find out, so we loaded a full set of grocery and meal kit competitors into our artificial intelligence marketing platform. Our Traffic Cloud™ served up some clear marketing opportunities to help meal kit makers weather the storm and come out on top. Google and Facebook have become synonymous with digital advertising. So much so, that it seems like digital marketers can sometimes overlook other powerful channels. Meal kit competitors are grappling with numerous new entrants and traditional players. This viscious competition not only fractures the total pot of customers, but also bids up advertising rates on Facebook, Google and other platforms. Meal kit makers are not just competing for customers, but more expensive customers. The effects are real and can be painful. 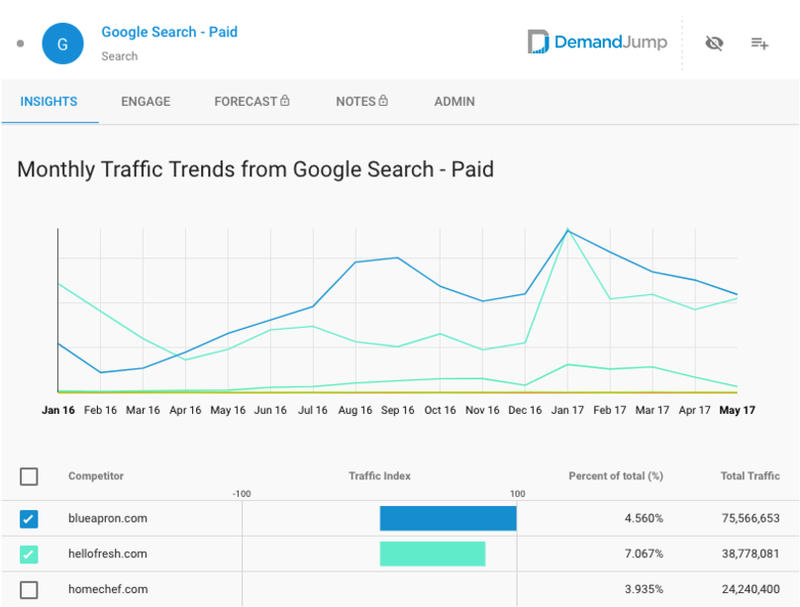 Insights garnered from the DemandJump Traffic Cloud™ show a decrease in the last 5 months in traffic generated from Facebook and Google across the entire grocery/meal kit ecosystem. This is especially true for some of the largest players in the competitive set, notably Blue Apron and Hello Fresh. The rising advertising rates are problematic, especially given the already high percentage of revenue that many meal kit companies are spending on customer acquisition. 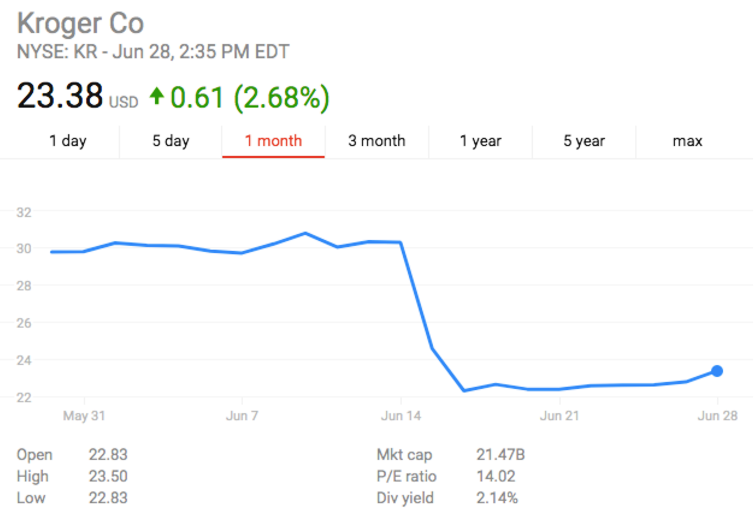 Blue Apron recently reported marketing costs as a percentage of revenue rose to 25% in the first quarter. This is up from 15% just one year earlier, contributing to a $53 million loss in the first quarter of 2017 (and a pretty sad first-day IPO). Expanding beyond traditional digital channels can make a huge differences in traffic and revenue generation. Even so, Blue Apron and Home Chef are bypassing more expected channels to capture customers on their terms. 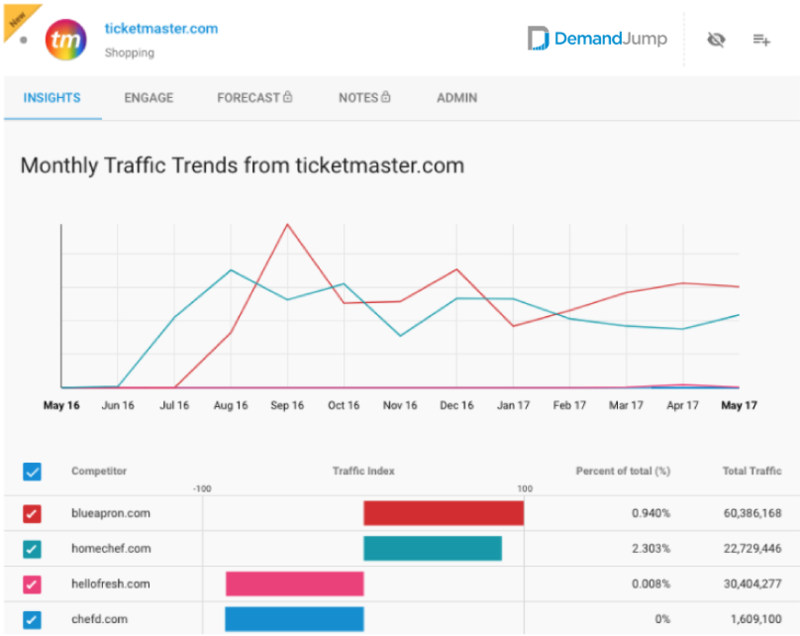 The graph below illustrates how they are leveraging Ticketmaster.com to drive traffic. 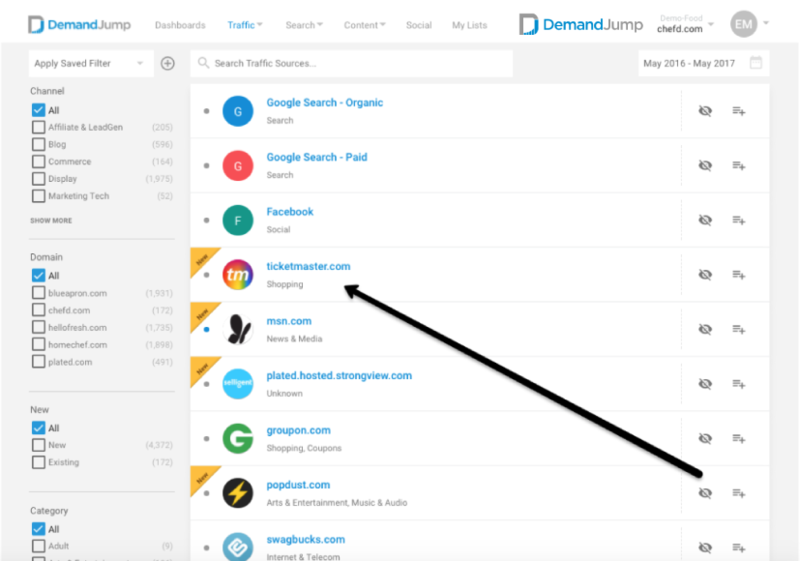 Ticketmaster is one of the most powerful sources in this traffic ecosystem… ranking almost as high as Facebook for its power to deliver new to file (see the graph below). And this is just one channel that may surprise you. If meal kit companies are going to stay relevant in the cutthroat grocery environment, they will need to find new, ideally less-expensive sources to acquire incremental customers. Let’s be honest. There aren’t vast differences between the end products that meal kit brands offer. To the average consumer, it’s all the same. To win, savvy brands need to stand for more than a convenient, tasty meal. Though Blue Apron is facing its fair-share of challenges, they have done an excellent job of connecting a quality product with a meaningful mission. Recent video ads preach a message of cleaner food, more sustainable agriculture, and faster farm-to-table fare. For the branding skeptics out there, how well is this messaging contributing to traffic? The graph above speaks for itself. Clearly Blue Apron discovered the power of video much earlier than the competitive set. They are continuing to outpace others, with traffic from YouTube skyrocketing since December of 2016. Hello Fresh has now jumped on the video bandwagon, boasting a mission which reads, “Help the world eat healthy, feel better, and live more”. Food provides an ideal platform for emotional messaging with its family, health and social implications. To win in the grocery wars, find your message and spread it. Video is a proven medium for emotional story telling. Meal kit customers are a busy group. That’s a big reason why they’re willing to pay a premium, relative to groceries and even some restaurant and takeout options. Sun Basket CEO, Adam Zbar, says, "If you're a busy professional, if you're a busy working mom, busy working dad, busy couple, it's just the type of thing where you can have the experience where we're almost like a farmers market in the sky, curated by a great chef." But this consumer comes with the expectation that brands will be flexible, adaptable and customizable - three words that aren’t always synonymous with subscription services. That could explain why many of these brands have extremely high customer churn rates after six months. Some newer meal kit services are starting to figure it out. Chef’d, who is positioned as the “first and only meal store”, sells their meals a la carte, with no commitments or subscriptions required. 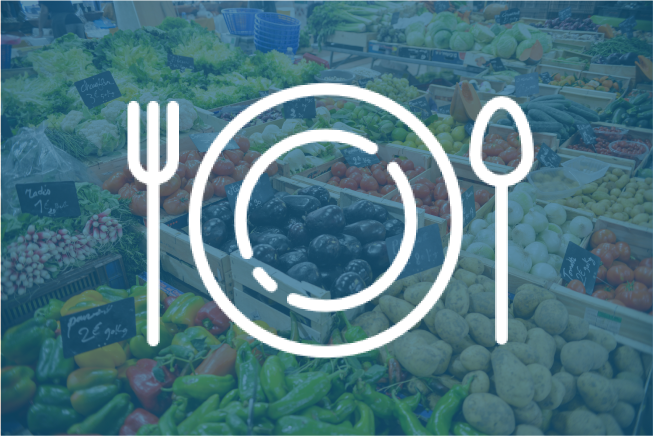 They offer thousands of possible ways to sort their menu items, including cooking time, proteins, cuisine, skill level, dietary lifestyle, allergens and spices. 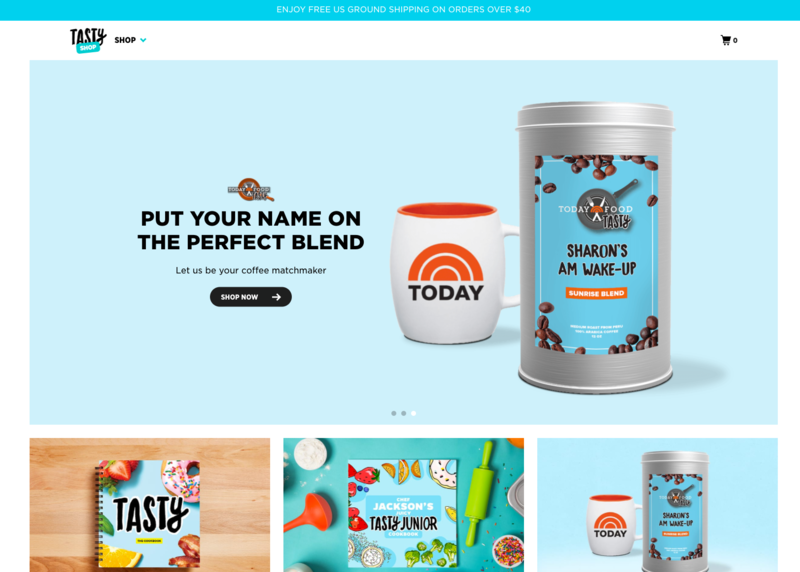 It’s this kind of customization that modern (aka profitable) consumers are looking for - especially the type of consumer that possesses the cash (and willingness) to pay for delivery meal kits. What do the above sites have common? The core messaging is all about living more efficiently, more healthfully and doing more with the resources you have. It’s about being flexible and rolling with the changes. Blue Apron recently expanded their product offerings to include wine. Bottles are curated and paired for each meal. And at just $10 per bottle, it's an easy opportunity to upsell current customers. Hello Fresh had a similar idea, launching a wine club with six bottles delivered monthly to your door. Customers can choose from several package options such as "Red", "White" and "Mixed". One look at recent searches reveals that Blue Apron and Hello Fresh are onto something. 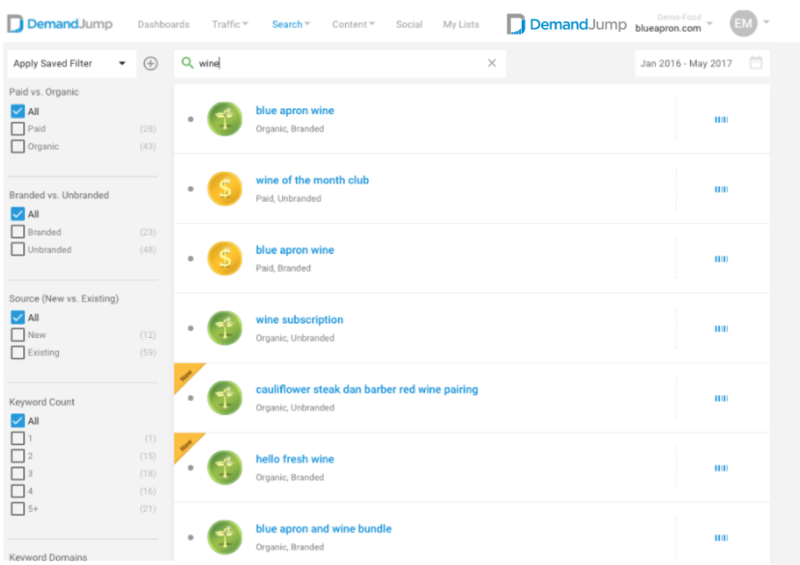 DemandJump Traffic Cloud™ revealed that search terms and phrases with the word "wine" are increasingly driving qualified buyers into this ecosystem. This got our research team at DemandJump thinking. We also envision a large opportunity in subscription content. Lots of meal kit companies already have relationships with the world's top chefs. A freemium membership model with access to videos, entertaining tips and tricks, articles and more, could be big money for the brands that are willing to invest. Meal kit and grocery brands should take a page from Tasty's book. Tasty is a subset of Buzzfeed and has built enormous success with their unique brand of cooking videos. They have since created their own cookbook, which is based entirely on recipes featured in their videos. Meal kit delivery services have a lot of market potential. But they are also facing some serious hurdles. “With hyper adoption can come hyper abandonment”, Brendan Witcher, an analyst at Forrester Research Inc. told WSJ. We’ve already seen several food delivery startups fail, notably Maple, SpoonRocket and Sprig Inc. Between Amazon’s bold move to dominate the space, traditional grocery retailers with established customers and lots of experience, and new meal kit brands popping up on the regular, it’s going to be a foodfight for sure. Meal kit services need to use sophisticated analytics to hone their acqusition strategies and contain their spend, or there won't be any leftovers, let alone dessert. 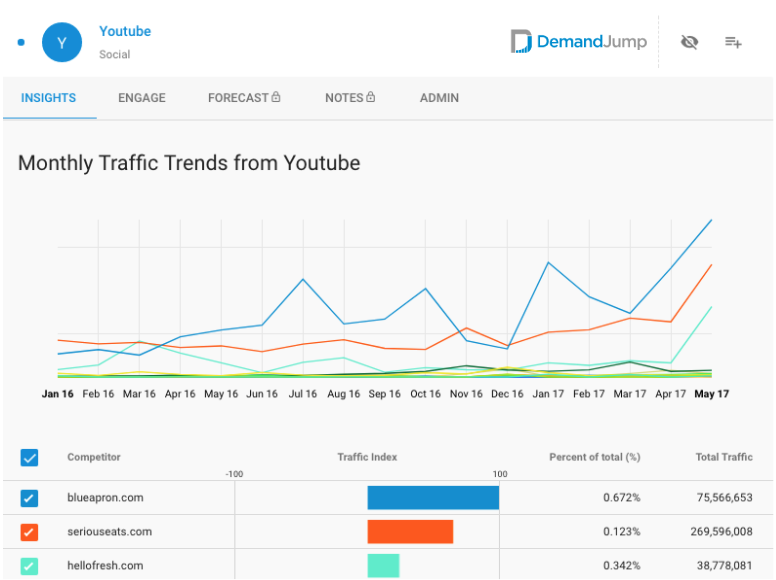 With the resources that DemandJump provides, they can position themselves to capture incremental traffic with marketing strategies as innovative as their business model. Are you looking for insights that’ll earn you a seat at the head of the table? DemandJump can help.